It's every boy racer's dream - to take the passenger seat in a Race Buggy with a V8 engine full of grunt! This dream can now be your reality. Wannabe racers are lining up to get in a V8 Race Buggy, an off-road buggy adventure, the only one of its kind in Australia! If driving isn't your thing, then why not book a hot lap session with an instructor driving a V8 Race Buggy. The hot lap circuit is undoubtedly one of the most extreme hot lap sessions in Australia. This hot lap session includes 5 hot laps, jumps,racing and sliding through corners at over 140kmh. Upon arrival for your off road racing experience, you will attend a drivers briefing on the rules and track conditions. 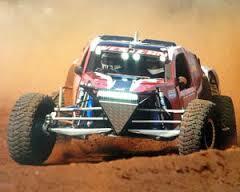 Then it's into the off road buggies for a drive around the track to get the adrenalin pumping!